lower left in graphite: Fox 99/250; lower right in graphite: A Miller Parker. 1940. Fowler, Alfred. Catalogue Raisonné of The Woodcut Society. Kansas City, MO: The Woodcut Society, 1942, no. 19. Czestochowski, Joseph S. James Swann: In Quest of a Printmaker, with Presentation Prints of the Chicago Society of Etchers, Prairie Print Makers, and the Woodcut Society. Iowa: Cedar Rapids Museum of Art, 1990, appendix C, p. 145, no. 19. Rogerson, Ian. 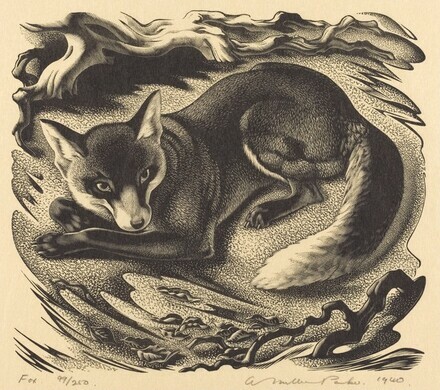 The Wood Engravings of Agnes Miller Parker. London: British Library, 2005, pp. 296, 316, no. RSP32.